We want to make the church ready, to be available and to be equipped for a specific purpose (the next move of God). There is always a move of God in every dispensation. God has something that He desires to do for His glory and for our benefit. God wants to do some changing in us so that He can do change through us. We cannot stay comfortable. God wants us to move out of what is comfortable, secure, and familiar in order for us to grow. Maturity with God is predicated on our dependence on Him. To mature us to grow into the image and likeness of Jesus Christ. Jesus says that He does not do anything apart from the Will of His Father. He does not say anything apart from the Will of His Father. 1) (Why) Teach us to know Why we are here. 2) (Who) Teach us to accept Who we are. 3) (Do) Teach us to fulfill God’s purpose. Goal: We would appreciate (take responsibility for) the gift that God has given us. Subtitle: If we are going to do the works of Christ it requires a changed heart. When your heart is truly changed, you know that He is alive in your heart. He makes Himself known. There is evidence – your prayer language and your peace. a) It causes you to trust Him with your whole heart. When you know He is alive in your heart, you can trust Him and depend on Him. There is evidence that He is faithful and trustworthy. You can trust Him. It is the Holy Spirit that changes your heart. When you are baptized with the Holy Spirit and when you release the power that dwells in the inside of you, then you know that He is alive in you. When you know that He is alive in you, then you will trust Him. Our hearts must be changed to trust God. 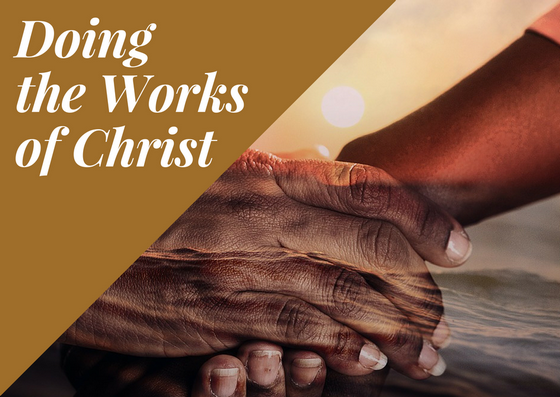 If we are going to do the work of Christ, it requires a changed heart. When our hearts are truly changed, then we know that He is living in our hearts. God can make himself known and we can learn to trust Him with our whole heart. When we trust Him, we can depend on Him, and we can have evidence that the Holy Spirit lives in our hearts.